Masala Pav is a spicy, finger licking food available on chaat gaadis/stalls on the streets of Mumbai. Had this few times during my college days. 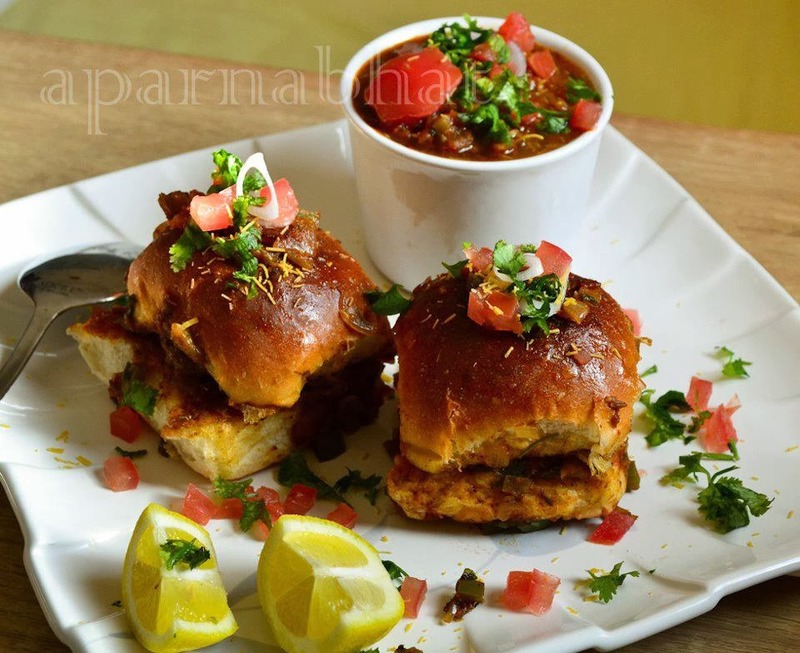 Butter-laden pav stuffed with spicy mixture of tomato, onions and pav bhaji masala powder garnished with chopped coriander leaves, onions is served with generous dollops of butter that tastes delicious. The aroma of the masala makes you drool and you cannot pass these stalls without having some. There are different recipes by different vendors. I googled for its recipe and opted Tarla dalal's recipe, made negligible variation to prepare them. Heat oil +butter [ 1 tsp +1 tsp] in a pan. Add onions and saute them for 2 minutes or till onions turn tranlucent. Add capsicum and saute. Add grated garlic, tomatoes, turmeric powder, red chilli powder and saute it for 5 minutes. Now add pav bhaji masala powder and salt as per the taste. Cook till all the ingredients blend well. Add lemon juice, chopped coriander leaves simmer on low flame for a minute and keep this masala aside. Meanwhile slit the ladi pav, spread butter on both sides and grill this pav on heated pan/tawa. Smear the cooked masala on the inner side of the pav and roast it. Repeat the steps with the remaining ladi pav. Garnish them with chopped tomatoes, onions, chopped coriander leaves, nylon sev[optional], and serve them hot with lemon wedges. 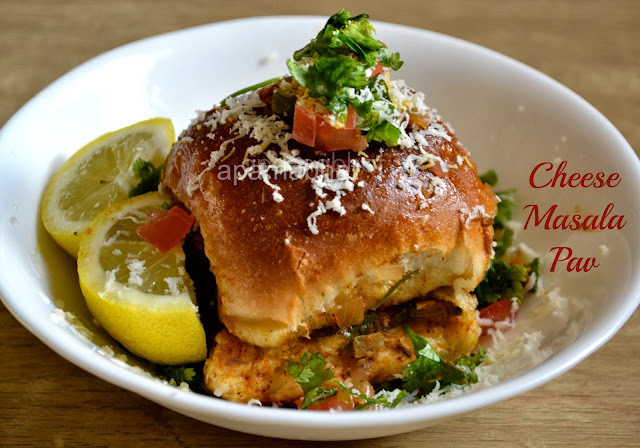 You can also garnish the masala pav with grated cheese and serve it hot as cheese masala pav. Wow. That's so tempting. Very well presented.. I am hosting my first food event at http://weliciousdelicious.blogspot.in/2013/07/corn-mania-food-event.html.